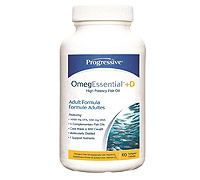 Each serving of OmegEssential™ provides 1,000 mg EPA and 550 mg DHA from small, cold water, wild caught fish oils. To eliminate contaminants, the oil has been highly purified through molecular distillation. In order to guarantee our purity and potency, every batch is tested and certified by IFOS (International Fish Oil Standards). Its standards have been established in conjunction with the World Health Organization. 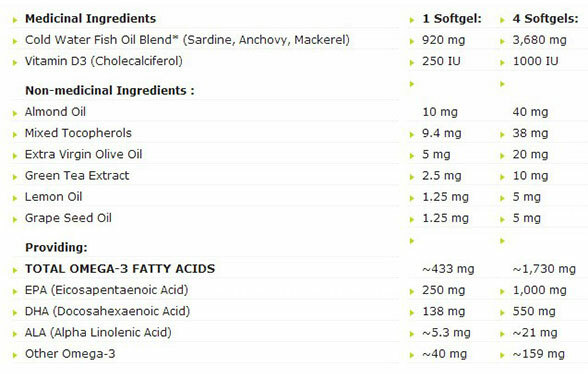 Our fish oil blend has received IFOS's highest rating of 5 stars. OmegEssential™ contains Almond Oil, Extra Virgin Olive Oil and Lemon Oil. These oils naturally support liver and gallbladder function, improving your body's ability to assimilate essential fatty acids and receive maximum benefit. Suggested Use (Adults): Take 2 softgels with breakfast and two softgels with dinner for a total of 4 softgels per day or as directed by a health care practitioner. Other Ingredients: Gelatin, Glycerin, Purified Water, Caramel Powder, Natural Orange Flavour. Contains no artificial flavours, colours, sweeteners or artificial preservatives of any kind.